cWatch is a next generation security information and event monitoring (SIEM) platform that allows MSPs to provide strong, real-time protection to customer networks. It features advanced event log monitoring, built-in reports, a powerful query system, auto-assignment of incidents, customizable dashboards and real-time alerts. The basic version of cWatch is free for thirty days. 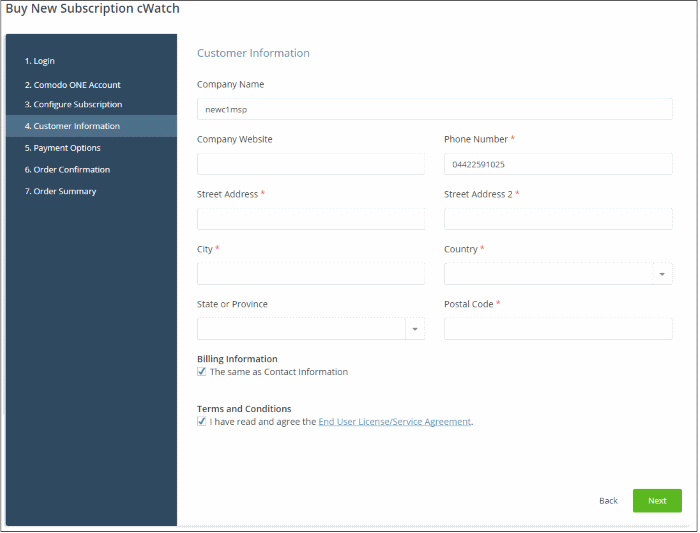 Account admins can upgrade to a full license from the cWatch interface at any time. 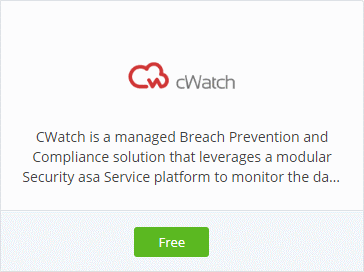 You can add cWatch to your account by subscribing for a new trial license from the Comodo One console. 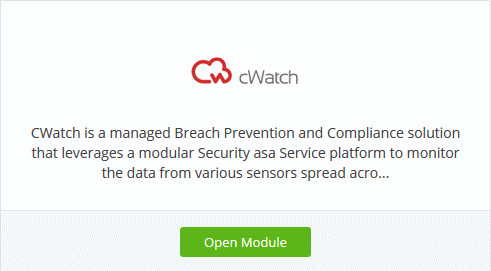 Alternatively, you can add cWatch by linking to another Comodo Accounts Manager (CAM) or C1 account that already has a cWatch license. The service can then be used by both accounts. Cumulative usage and validity are bound to the original license limitations. This will open the product purchase page. No payment details will be required to set up the free trial. 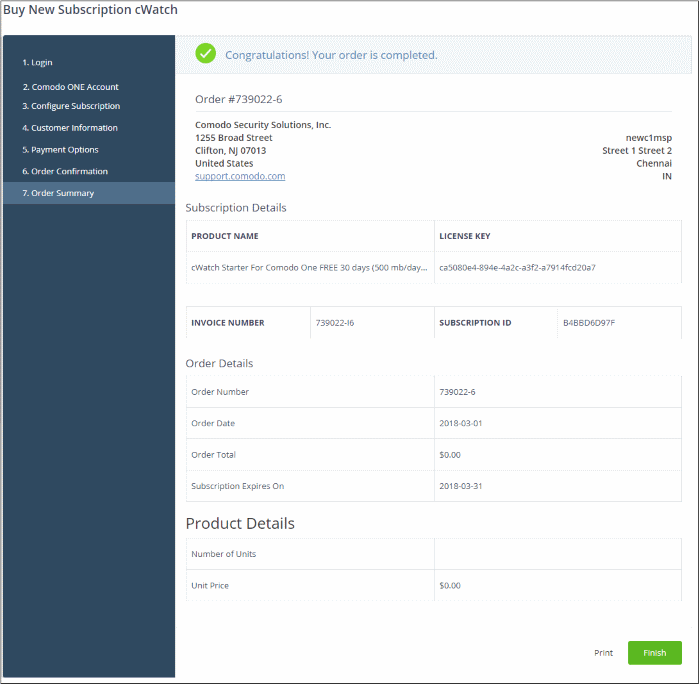 Your order will be completed and the subscription details will be displayed. You will also receive a mail with the order details and the license key. After the purchase is complete, cWatch will appear in the Applications' interface. See the description at the end of this section if you need more help to open the cWatch interface. You can activate licenses for your C1 account through the 'Store' interface. You can also activate licenses in linked accounts. To do this, you must first have linked an account and set it as default. See Comodo License Account Details for more details on this process. 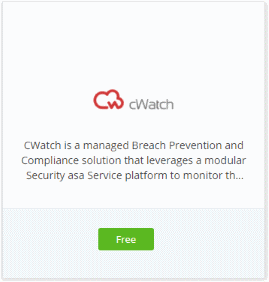 Click 'Free' on the cWatch tile. The license will be activated and cWatch will be added to your list of licensed 'Applications'. The cWatch interface will open. 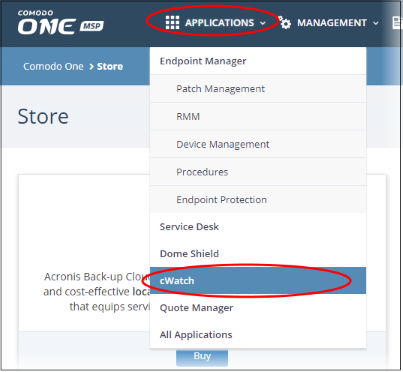 The cWatch interface will open in a new tab or in the current tab as configured in 'Settings' > 'Comodo One Application Launch'. See Configure application launch settings in Configure C1 Settings for more details.